How did you celebrate Easter this year? With your Family? I wish I would have done that, but the Atlantic ocean doesn't allow me to do so. Well, when family is not an option, the only thing left is Metal. Dear Old Friend. Well, dear friend for sure, but the age factor depends on how you look at it. In my case, I am a longtime Heavy, Trash and Death Metal fan, but the Black side of my beloved music still remains unknown to me. Why? I don't really know. I think I had a psychological blockage for years because of the very graphic and gore pictures on my neighbor's T-Shirts when I was a kid. Anyway, the style is growing on me now, and I want to explore it. I need to start somewhere, and I thought The Dark Easter Metal Meeting was a great opportunity. 11 bands played that day, and even if I listened to 10 of them, I will not write about all of them. I cannot describe their music correctly and give you a real impression of what I heard. I feel I could mixed them up, because they were so many. And honestly, I am not sure I could distinguish the music of one from the music of the other if I would hear it again. I have not heard any bad bands, but, to my opinion, some were average. Not bad, but I will not remember them. Others, on the other hands, were awesome! So I thought I would give you the highlights of my day! It was the first band to perform, and despite a not so full room and the early time, they were terrific. First, I like their sound. I like how aggressive their music is, I like that their vocals incorporate clean voices, and is not only and purely screaming. Second, I find their staging outstanding. On the moment, they made me think of Nocte Obducta. Both bands are different, don't get me wrong, but they both use a powerful staging. The visual effects only generate some feelings and emotions. Nocte Obducta is way more melancholic and romantic, whereas Wraithcult creates a dark, sinister atmosphere, full of sorrow and despair. 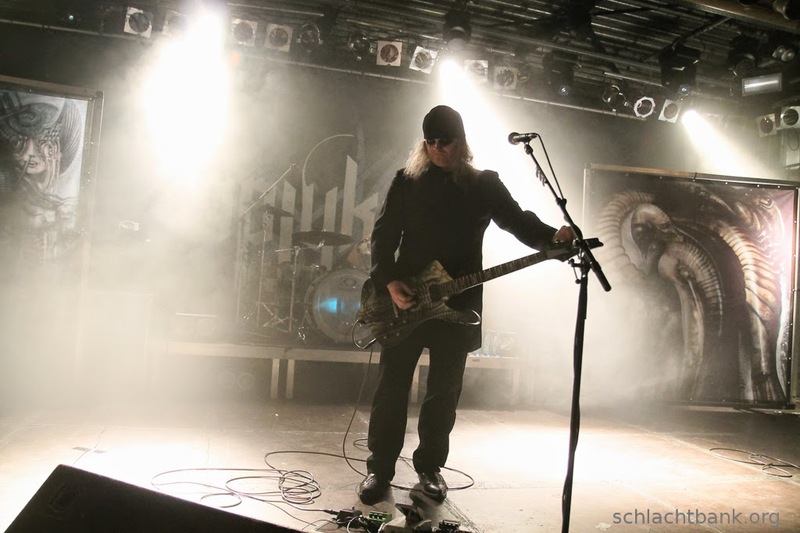 After the concert, I read a bit about a couple of bands, and I discovered that two members of Wraithcult also play with Thulcandra (see below). This life is full of surprises. Check them out, and like their Facebook page, they are a great discovery of mine! Ready for some satanic cults? You're gonna scream Satan's name a whole lot with Root, a Czech band. 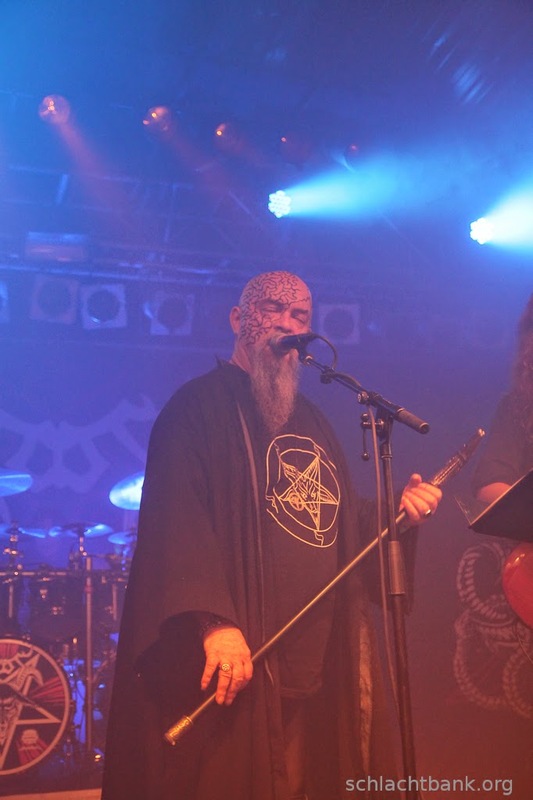 The vocalist actually belongs to Satanism. I like their music, I really do, but they don't sound as Black as I would expected. They probably belongs to the genre because of the topic of their lyrics, and everything surrounding it, but the music itself doesn't sound Black. The structure of the music, the speed, the solos, the vocals are kind of watered down into a Heavy-ish style. Does it make any sense? A mix between Black and Heavy metal. Can I say it? Oh well, I say it. What really impressed me was their staging. They bring you into their mystic world. The vocalist's clothing and make-up, the satanic symbols everywhere, the lightning on the ground, giving the impression they are coming directly from Hell. All these elements envelop you in an occult ambiance. It was great! Definitely the best visual of the festival! I was told this band was good, and that it was a side project of another band, without more precisions (or I didn't understand them). I came into the Halle with excitement and semi-high expectations. Then, I saw Steffen Kummerer on stage and my jaw dropped to the floor. I have no words to describe my surprise and my happiness. 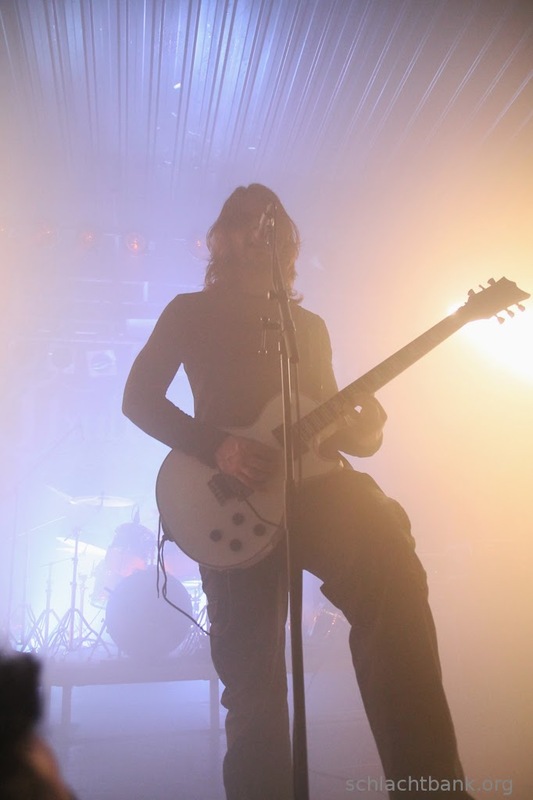 Steffen Kummerer is a musician I deeply love, and I have no clue how I missed the fact he was playing in this band. Where the heck have I been? The music is exactly what you would expect from Kummerer: astonishing and incredible. I would not say they are a totally and pure Black metal band. I probably associate Obscura and Thulcandra, and that's why I don't give them the authentic 'Black Metal' label. I don't know, what do you think? The exact name we give them doesn't really matter to me, I love it! Count on me to deepen their material, and to purr on Kummerer's voice. Here comes the biggest name of the day. I knew them a little bit before the festival, but not as much as I should. I had already listened to some of their songs and I could have associated the singer's face with the band, but not much more. How was their performance? Epic. Freaking Epic. I don't think I could say more. I liked everything about their style and the energy in the crowd was terrific. What more do you want? So a short text for these Masters, just because one word is enough: Awesomeness. As I said, I am a total newbie when it comes to Black Metal, so I don't feel comfortable to describe it as I am with Trash or Death. I probably wrote some insanities if Black Metal is your thing. If I did, please let me know. Tell me what to check out, what I should be aware of. Share your knowledge. I want to discover this dark side of Metal. 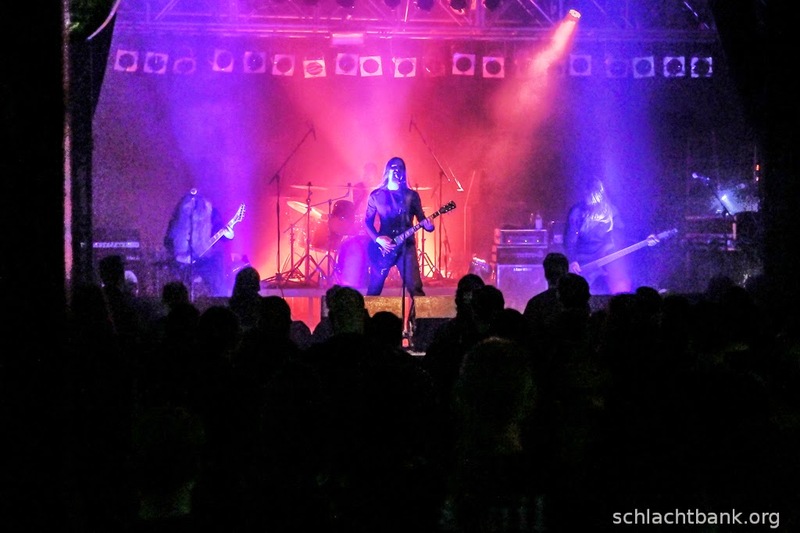 Thulcandra plays a style heavily influenced by such Bands as Dissection. I wish you all the best for your further journey into the Black Metal genre.